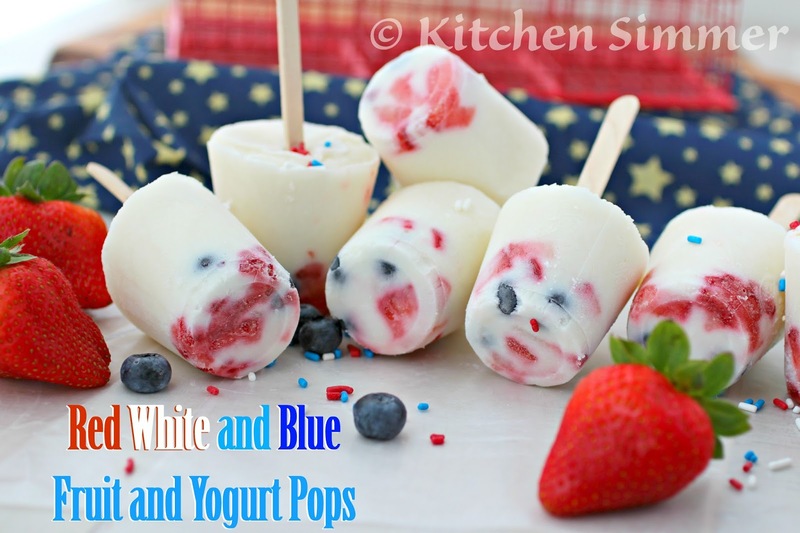 These sweet and creamy Patriotic Greek Yogurts pops are a great way to cool off this 4th of July. The kids wanted to make something special this holiday weekend to enjoy during the firework celebrations. 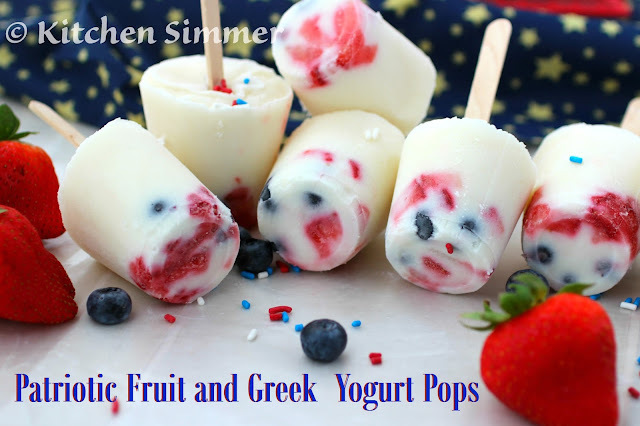 We decided on these easy and fun Greek Yogurt pops. Blueberries and strawberries are in season right now and I had a bunch in my fridge to enjoy. I knew they would make the perfect topping for my pops since they are red and blue. The kids set to work on prepping the fruit and getting the yogurt ready. They were done making these pops in less than 10 minutes and the hardest part was waiting for them to freeze so we could enjoy them. I had them make these pops before bedtime so the waiting would happen while they slept. Otherwise, I would have heard a bunch of "Can we check if they are ready yet?" coming from my two little chefs. This morning, we simply peeled off the paper cups and enjoyed away. They make a great breakfast too since Greek yogurt and fruit is a healthy way to start the day. They are all gone now so we will have to make another batch to eat while watching the fireworks! Step 1: In a blender, blend together the Greek Yogurt, sugar and vanilla until smooth and fully mixed. Taste sugar and adjust as desired. Blend again if necessary. ** Note: To make sugar free substitute Splenda here. If you like it sweeter, adjust as desired. Step 2: Wash fruit and chop strawberries. Place chopped strawberries and blueberries in the bottom of a paper "Dixie" paper cup. Top with yogurt mixture. Step 3: Place a popsicle stick (food grade) into the center of each cup and freeze overnight until set. 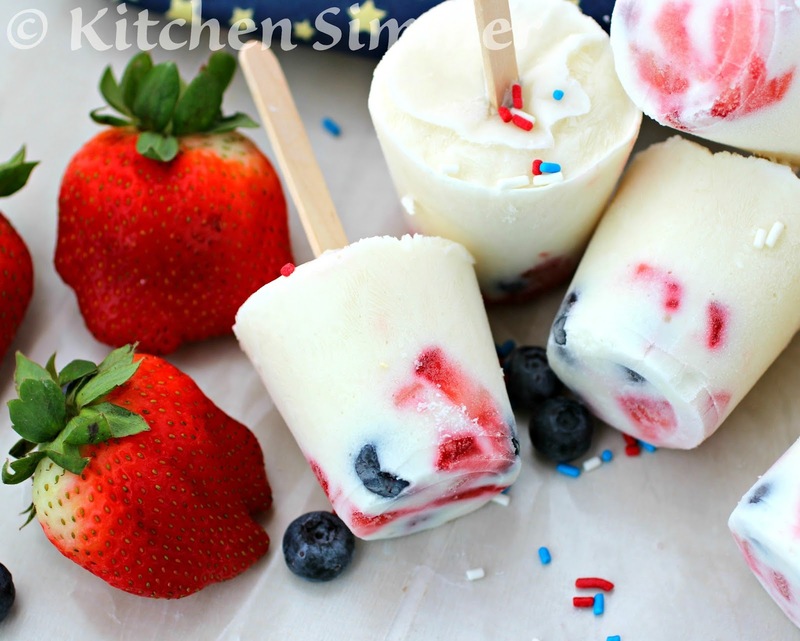 Step 4: Take frozen pops out of the freezer and thaw for 5-10 minutes. Then peel off the paper cup and enjoy. 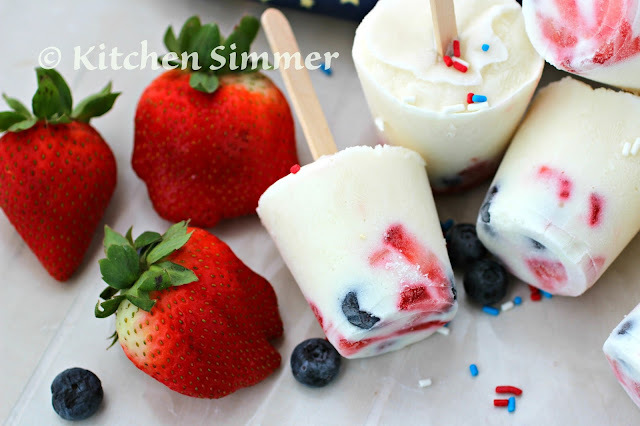 Note: Place cups on a freezer safe plate or tray for to keep pops upright and easy to transport from table to freezer. I bet using real vanilla flavoring made a big difference!